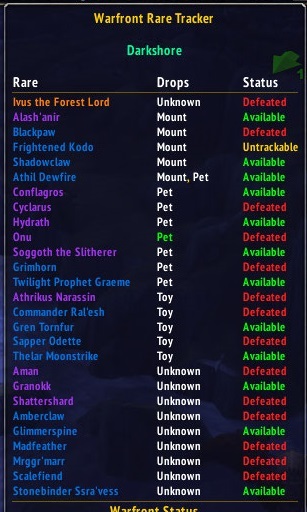 This add-on allows you to keep track of your kills, loot of the Rare's and Warfront status in multiple Warfronts. It has both a mini-map icon and broker integration. It checks your kills on their quest ID now so it's automatically checking which one you've killed already and also resets once they're available again. It's also only loading the rare's regarding to your players faction. When TomTom is installed it exports the rare's coordinates to TomTom when clicked on the rare in the menu. Release 0.9.9 has a Party Announcer implemented to broadcast to which Rare you're heading to. See the Changelog for more info. I've implemented a Warfront "Time travel" Phase detector which is set enabled by default. With this option enabled, Icons only show on the World and Minimap when in the correct Phase. When you talk to a "Time Traveler NPC" in the area to return to the past the Icons will disappear. Talk again to go to the present time enables the Icons again. This feature overrules "Show Only at Level 120" as low level characters always are in the 'past' phase of the zone, so no Icons will be shown. So if you're missing Icons, it's because of this feature. If you still want the Icons to be available all the time or on a low level character you can turn it off in the options windows under the Master Filter or the "Worldmap Icons" section. The option to hide for 120 is still in in case anyone wants to use it but the options is disabled once the Phase Detector is active. New option: "Keep Warfront Selection Menu Open" in the "Menu" Section of the options screen to allow the selection menu to stay open open for a faster Warfront change. Your chosen Warfront will be highlighted in a light cyan color. New Filter option: "Always Show Worldboss" to allow the worldboss to be seen even if it doens't drop loot. With this option enabled the Icon only hides when you have defeated him. Added a shared "Master Filter" which can be used in multiple features. They can be overridden on each feature that has a "Filter". 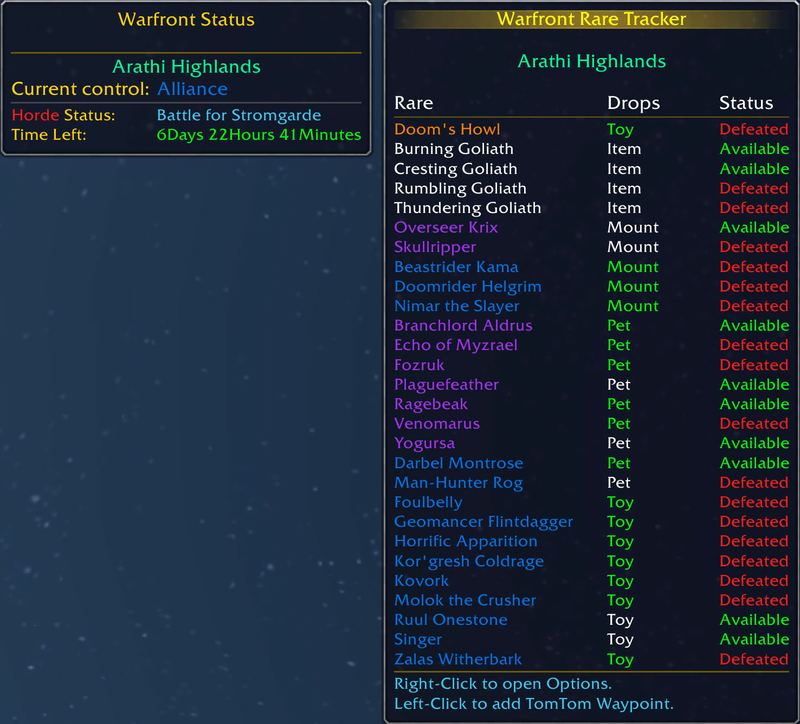 Completely overhauled the "Framework" to support the multiple Warfronts and multiple loot per Rare. Added more information about the selected Warfront in the broker text (only visible when using a broker handler). Please take a look at the config window for more info about the different options to display. For the Alliance and for the Horde. full explanation is found in the config window! Icon color: Purple have over 1M HP, Blue have over 100K HP, Grey are Goliaths and Red for Rare's only active when your faction controls the Warfront. You don't have to post a link to the issue page. I check it a few time a day as I somehow don't receive an email once a comment is made on both pages(curse and project page) or issue is created. Only when someone replies on a message I get an email. Weird stuff, I've tried a lot of combinations op the email options in my account settings but it just won't do. What's left is to manually check the page a few times a day, which I do :). And I've posted an answer on it. Can u add please option for A-Z name sorting at rares list? I need fast check have i killed WQ rare before or not. That's already in there since idk how long. you can find it under the "Menu Sorting" category in the options window. There is an image here, set the dropdown box called "Sort Rare's On" to "By Name" and voila. oh, sorry, my bad. Ty for answer! This is one of my favorite addons. Thank you for the work done :) . Thanks for the cheer up. And always keep an eye out for updates as I have a few new features planned. Just had a little setback, got the flu or a cold the last week but I'm on the bettering hand again. So I'm going to resume implementing some requests and other things I have in mind. oh I'm sorry, I hope you get better from your cold, thanks again for the addon. 2) Can we also have a faster way of switching between the warfront lists? Right now you need 3 clicks. 1 click to open the window and 2 clicks to open the toggle and select the other one. This slows things down when you try to check the saves on multiple alts. Maybe only have the warfront selection list instead of the header? Thanks for the cheer, really appreciate it as it take time to code and I love to hear positive sounds. 2) This is possible. I might make it a config value. By default it reacts the way it does now and in one of the config categories I will make a checkmark to leave the selection open and highlight the selected zone. Edit: If you have TomTom installed, you can also click the Rare in the menu to export it's position to TomTom (in case the icon is hidden under a WorldQuest button). It can be handy until I have a GUI ready! In the next release you can go to the options window and select the "Menu" tab. There will be an option called "Keep Warfront Selection Menu Open". Check this to keep the menu open. 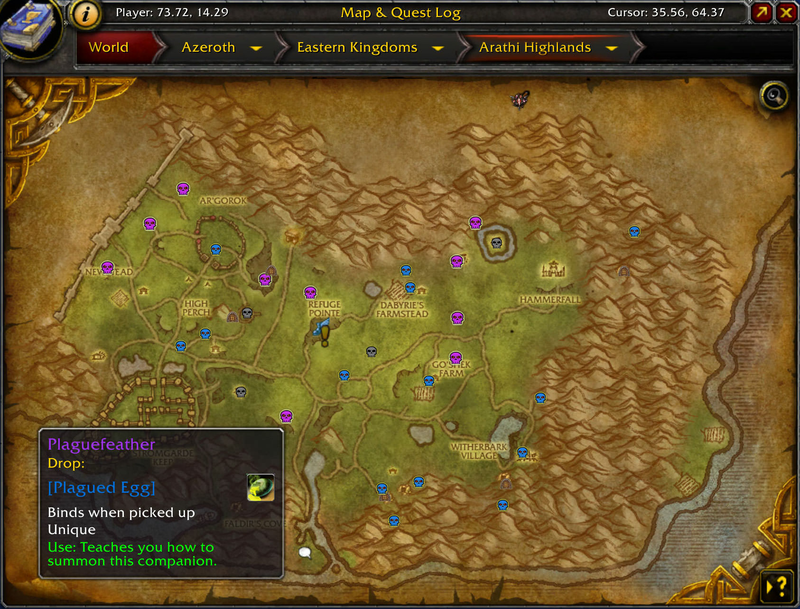 Also a new addition: Shift-Click on the Minimap/Broker Icon to cycle through the different Warfronts. The update will be ready tonight! Thank you so much for the update! It's perfect! Keep up the good work! No problem. And as promised, the GUI will come on a later update. I always had plans to go for a GUI but As I'm using ChocolateBar I made a broker version instead. But there is no problem is having both options of course. As said, I have no ETA on this as I'm working on other stuff first. Is there any way to skip the logon spam once I've seen it? I get it on all my toons every time I log on. Apologies if this has been addressed already. I did look thru other posts. I shall add something to only let it show once per toon, or remove it completely in the next update as I think most people are aware of the new new Warfront by now I think,. Haha. Thanks for the quick reply! MinimapButtonBag is grabbing the icons from the minimap and throwing an error. Disabling the option to have minimap icons and reloading the UI fixes the issue. Interesting. So this only happens with the Minimap Icons, not with the Worldmap Icons? Not sure why exactly but it seems that all 'Minimap Icons' are also being registered as a addon icon. Never heard of it with other addons and I'm using the same 'Icon handler' as I do. I'll dig a little deeper into it tomorrow, install the addon you're having this issue with and see what I can do. If the answer to my first question is yes I'm happy as the addon functions perfectly without minimap icons so you can still use it. I'll keep you updated. Yes, it's only the minimap icons. It isn't a big deal for me because I'll most likely keep them disabled. Other people may not feel the same way though. I've found out that MinimapButtonBag is indeed "stealing" all Minimap icons but it has a blacklist. If the name is in the blacklist, MBB is skipping, not collecting it and just shows the Icon as it should. I shall try to get it fixed, maybe even with the help of MBB's author but I have a temp solution for you if you aren't too scared to edit MinimapButtonBag.